How accurate is FreeStyle Libre? The FreeStyle Libre flash glucose monitoring system is clinically proven to be accurate, stable and consistent over 14 days. It does not require finger prick calibration and may be used in place of routine finger prick glucose testing. In a clinical study1, the FreeStyle Libre system achieved 11.4% mean absolute relative difference (MARD) compared to blood glucose testing. How do I ensure the sensor sticks on my upper arm? Use the supplied disposable applicators to apply the FreeStyle Libre sensor to the back of your upper arm. It should stay in place for up to 14 days, even while you shower, swim, bathe or exercise1. Please follow the instructions found in the user manual for skin preparation and application. 1 The sensor is water-resistant in up to one metre of water. Do not immerse longer than 30 minutes. You can pay quickly and securely online via credit card or debit card. It normally takes up to 3 working days to process and deliver your order, assuming it's placed and paid for successfully before 2pm. You can check the status of your order 24/7. Simply look up the tracking number on your shipment update to see the current status of your order. Where else can I buy the FreeStyle Libre system? What is the FreeStyle Libre system? FreeStyle Libre is the first flash glucose monitoring system. It is designed to liberate people with diabetes from many of the hassles of glucose monitoring, such as routine finger pricks1. 1. FreeStyle Libre sensor - A small, disposable 14-day sensor that is worn on the back of the upper arm and automatically measures glucose levels, storing them for 8 hours. Every time you scan the reader over the sensor, the glucose data from the sensor is transferred to the reader in just one second. 2. FreeStyle Libre reader - A compact, handheld reader that displays glucose readings and stores up to 90 days of glucose data. When the reader is scanned over the sensor, it shows a current glucose reading, the last 8 hours of data and a trend arrow indicating if glucose is going up, down or staying steady. To obtain a glucose reading, simply perform a quick, one-second scan of the reader over the sensor. This gives you more information than blood glucose monitoring, without the need for routine finger pricks1. How do I store the product at home? The FreeStyle Libre reader and sensor should be stored between 4°C to 25°C. Can you deliver the FreeStyle Libre system to another country? No, we cannot deliver to addresses outside Singapore. FreeStyle Libre sensors are programmed for sale in a specific market and are compatible with readers sold in that market. FreeStyle Libre sensors in Singapore are not necessarily compatible with FreeStyle Libre readers in other markets. In addition, differing national regulations governing the import of medical devices mean the FreeStyle Libre system cannot be delivered to other countries. Traditional blood glucose monitoring provides users with glucose readings that represent distinct points in time. Users do not get information about how their glucose levels have been changing or where their glucose levels are heading. This means it can be easy to miss glucose fluctuations. The FreeStyle Libre system, which is based on flash glucose monitoring, is a new way to obtain glucose readings. It allows the user to get their current glucose reading by just scanning the reader over the sensor, and also provides a complete picture of glucose variations. Flash glucose monitoring is a new, user-friendly way to discreetly obtain glucose readings. A flash glucose monitoring system provides a complete picture, showing the current glucose reading as well as how glucose levels are changing, simply by just scanning the reader over the sensor. 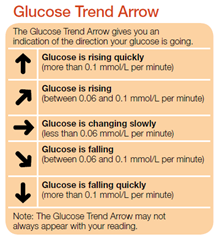 With a quick scan of the reader over the sensor, users get a complete picture of their glucose - including the current glucose reading, 8 hour historical line graph, and trend arrow showing if their glucose level is going up, down or staying steady. To obtain a glucose reading, simply perform a quick one-second scan of the reader over the sensor. This quick scan gives you more information than a blood glucose test, without the need for routine finger pricks1. The FreeStyle Libre system also offers software to generate concise reports that provide a clear analysis of your glucose data. 1 A finger prick test using a blood glucose meter is required during times of rapidly changing glucose levels when interstitial fluid glucose levels may not accurately reflect blood glucose levels or if hypoglycemia or impending hypoglycemia is reported by the system or when symptoms do not match the system readings. Yes, glucose readings based on interstitial fluid (ISF) are a reliable indicator of blood glucose levels1. The physiological lag in ISF glucose, with respect to changes in blood glucose, is about 5-10 minutes,which is unlikely to impact routine day-to-day treatment decisions1. The average lag time of the FreeStyle Libre system is approximately 4.5 minutes2. 1 Rebrin K, Sheppard NF Jr, Steil GM. Use of subcutaneous interstitial fluid glucose to estimate blood glucose: revisiting delay and sensor offset. J Diabetes Sci Technol. 2010;4(5):1087-1098. 2 Bailey, T, et al. The Performance and Usability of a Factory-Calibrated Flash Glucose Monitoring System. Diabetes Technology and Therapeutics v17 n11 July 2015 (10.1089/dia.2014.0378). No. For convenience, there is a FreeStyle Optium blood glucose and ketone meter built-in to the reader that can be used for blood glucose and ketone readings. The FreeStyle Libre flash glucose monitoring system can measure interstitial fluid glucose levels in people aged 4 and above with diabetes mellitus. Children aged 4 to 17 should be supervised by a caregiver who is at least 18 years old. The caregiver is responsible for supervising, managing, and assisting the child in using the FreeStyle Libre system and interpreting its readings. 'Flash' refers to users being able to obtain glucose readings quickly by just scanning the reader over the sensor. Flash glucose monitoring easily provides meaningful insights to people with diabetes and their healthcare professionals. Do I need to calibrate the FreeStyle Libre system? 1 Bolinder, et al. Novel glucose-sensing technology and hypoglycaemia in type 1 diabetes: a multicentre, non-masked, randomised controlled trial. The Lancet, published online 12 Sep16. Yes, you can use the built-in meter to check your blood ketone levels using FreeStyle Optium ß-ketone test strips.You should perform a blood ketone test on your fingertip only. Be sure to read the test strip instructions before using the built-in meter. We are committed to making our products safe. After the insertion, the sensor and the body need to equilibrate (or settle). Our research suggests it is not always easy to accurately measure glucose in the body until this equilibration happens. By letting the system equilibrate for one hour, users can be sure they receive accurate glucose readings. How should I discard the disposable components, such as the sensor pack and applicator? Contact Customer Service for further information on appropriate disposal of system components. . Currently, data upload from Mac-operating computers and Microsoft Edge browser are not supported. The LibreView is compatible with a Microsoft-operating computer with Windows 7 or higher. Call our Customer Care Team at 1 800 272 2881 or +65 3158 2577 and enter '3' to get connected to a dedicated LibreView support. The FreeStyle LibreLink app is a mobile medical app designed to work with FreeStyle Libre sensors. The app enables you to monitor your glucose using your iPhone or Android phone1 with a FreeStyle Libre sensor — there is no need to use a separate blood glucose meter for routine glucose monitoring.2 When you scan the sensor with a compatible phone that’s running the FreeStyle LibreLink app, your glucose data is displayed directly on that device. To use the FreeStyle LibreLink app, you must register with LibreView, a cloud-based diabetes management system provided by Abbott and Newyu, Inc. Please see the product labeling for FreeStyle Libre and the FreeStyle LibreLink app for specific instructions on using the different products, including the supported age range. Important: You must have a compatible iPhone or Android phone to install and use the app (See Compatibility Guide). Is the FreeStyle LibreLink app approved for sale in the Singapore market? Yes, the FreeStyle LibreLink app is approved by Health Science Authority (HSA) in Singapore. No, the FreeStyle LibreLink app is the only app that has been tested by Abbott Diabetes Care to be compatible with FreeStyle Libre sensors. The FreeStyle LibreLink4 app was developed to ensure compliance with local regulations, including safety and performance requirements in accordance with the intended use. Any product that is intended to be compatible with FreeStyle Libre sensors would also need to comply with these regulations as well. What is near-field communication (NFC) and how do I know if my phone has it? NFC is the wireless communication technology that enables your FreeStyle Libre sensors to wirelessly transmit data to another device. For iPhone users: You must have an iPhone 7 or higher running iOS 11 or higher to utilize the NFC capability needed to scan the FreeStyle Libre sensor. After you’ve applied a FreeStyle Libre sensor to the back of your upper arm, open the app and hold the back of your Android phone near (exact distance will vary by phone) the FreeStyle Libre sensor to scan it. The size and location of the NFC antenna in Android phones varies by make and model, so you may have to move the phone around to find the best position for scanning the FreeStyle Libre sensor. After you’ve applied a FreeStyle Libre sensor to the back of your upper arm, open the app and tap one of the scan buttons within the app to put the iPhone in a scan ready state. There are two types of scan buttons – a blue button on the Home screen and a gray scan icon in the top right corner of most screens. Hold the top edge of your iPhone near the sensor and do not move your iPhone until you hear a tone and/or feel a vibration, which indicates the scan is complete. What are the differences between the FreeStyle LibreLink app and the FreeStyle Libre reader? Sharing: Reports in the FreeStyle LibreLink app can be shared directly from the phone. You can connect the reader to the computer with a USB cable to upload data. Viewing: The reader features a simple color touchscreen. Graphs are displayed in more color and higher resolution in the app. Notes: You can add notes in the reader within 15 minutes of a glucose reading. The app allows you to add and view notes at any time in the Logbook. Text to Speech: If enabled in the app, you can hear the glucose reading with the unit of measure and trend arrow direction after each scan. Reports: The reader and the app use the same calculations to create glucose reports. Compared to the Reader, reports in the app will have more color, details, and interactivity. The app can also display an estimate of your A1c, in addition to basic stats about your glucose history in the last 24 hours. Reminders: The app allows you to easily set custom reminders, as well as an 8-hour timer that resets every time the sensor is scanned. App notifications on your phone must be enabled to see reminders. Other: The reader has a port for test strips, so it can be used both for scanning sensors and blood glucose readings. If you have any questions about the app or your data, including questions on how to close your LibreView account, go to FreeStyleLibre.com.sg for customer support contact information. 3LibreLinkUp is a mobile application, developed and provided by Newyu. 5To use both the FreeStyle Libre reader and the FreeStyle LibreLink app with the same sensor, start the sensor with the reader first and then scan with the app. Data is not synchronized between devices, so to ensure your reports include all available data choose one device that you will use to scan your sensor at least once every 8 hours.